Rockstar has revealed more information about the new Red Dead Redemption ‘Liars and Cheats’ DLC pack ahead of its release on the PlayStation Network and Xbox Live tomorrow. Liars and Cheats, the penultimate DLC pack for Red Dead Redemption offers something that Rockstar stay is the most fan requested multiplayer feature, Multiplayer horse racing. The races will support up to eight players in a tournament that consists of three to five races, with players earning points for the position they finish and deciding their final ranking when the cup is over. 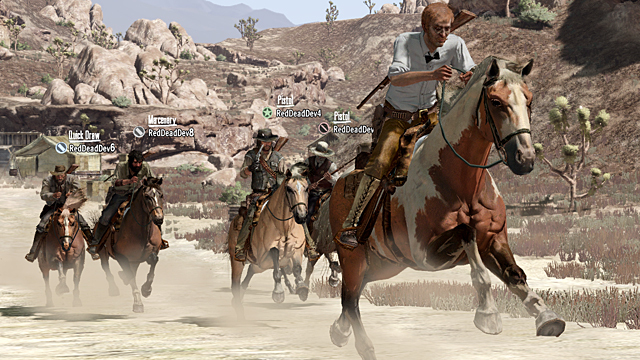 Unlike horse racing in Red Dead Redemption’s single player campaign, the multiplayer horse racing introduced in Liars and Cheats lets you shoot at your opponents, but not until after designated brief period of calm at the start of reach race. However, in order not to make things too easy, and to allow players to actually race, there’s no auto-aim and a limited supply of weapons say Rockstar. If you are killed during a race, you simply re-spawn with a time penalty. You can see full details about the Multiplayer horse racing set for introduction in Red Dead Redemption: Liars and Cheats here. Other features set to be introduced in the Red Dead Redemption Cheats and Liars DLC include multiplayer poker and liars dice games, new hang hideouts, new hunting grounds and a new attack and defence game mode, Stronghold. The DLC will also allow players to choose multiplayer skins of a variety of characters from the Red Dead Redemption single player campaign and introduces new achievements. The Red Dead Redemption Liars and Cheats DLC pack is released on September 21st at a cost of 800 points on Xbox Live, or £7.99 on the PlayStation Network. Red Dead Redemption is one of the most successful games released this year, and still features in the top ten of the UK chart, despite being released all the way back in May. So Train2Game, are you still playing Red Dead Redemption at all? If so, would you be tempted to part with your money for new multiplayer content? Or do you think Rockstar are going a bit far and charging too much for the Liars and Cheats expansion pack?